Being an MMORPG, a constant internet connection is required to play. 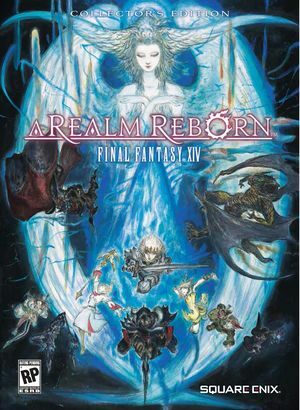 Originally released as FINAL FANTASY XIV on September 22, 2010. Cross-platform play with PlayStation 4 players. Free content updates are released every 3–4 months, though most content may require the latest expansion to play. Install the client and use Mog Station for CD key and account management. Does not require the Steam client to start. Expansions will have to be purchased on Steam to activate properly on a Steam-enabled FFXIV account. The NA version requires a North American Square Enix Account. The PAL version requires a European & other Regions Square Enix Account. Apply the Final Fantasy XIV: A Realm Reborn intro skip. Client and character settings can now be backed up to the servers as of Patch 4.45. AMD Eyefinity doesn't work with DX11. Cutscenes feature black bars when playing in 21:9 resolutions. Bilinear and Trilinear filtering modes are also available. Implemented as part of the "Frame Rate Limit" option. Both X and Y axes can be inverted independently. Options for both 3rd and 1st Person camera modes are available. Must input Username and Password with Keyboard. Chat and other features may also require keyboard input. Button prompts can be changed manually between ABXY, DualShock, and DualShock + Touchpad modes. Music, Sound Effects, Dialogue, System Sounds, Ambient Sounds, and Performance. Volumes for the player, party members, and all other player characters can also be adjusted independently. Featured in all cutscenes and dialogue events. Cannot be disabled. See Helix Mod: Final Fantasy XIV: A Realm Reborn v1.0 W.I.P. Requires an internet connection at all times while playing. Multiple data centers to choose from depending on player region. See Final Fantasy XIV - A Realm Reborn + Heavensward + Stormblood. This is a generic error code for disconnection from the game server. This issue may have something to do with your local network configuration, or ISP packet shaping/throttling. Save the file and restart the game. 9, 11 DirectX 11 support was added alongside the Heavensward expansion (Patch 3.0). Tied to the DirectX 11 executable. Added alongside the Heavensward expansion (Patch 3.0). Requires 1280x720 resolution or higher. System requirements may change with the release of new expansions. A resolution of 1600x900 or higher is recommended. Certain Japanese language conversion functions differ from the Windows version. Graphical corruption issues may occur under certain circumstances if using Intel Iris Pro graphics. ↑ File/folder structure within this directory reflects the path(s) listed for Windows and/or Steam game data (use Wine regedit to access Windows registry paths). Games with Steam Cloud support may store data in ~/.steam/steam/userdata/<user-id>/39210/ in addition to or instead of this directory. The app ID (39210) may differ in some cases. Treat backslashes as forward slashes. See the glossary page for details. ↑ Celadin comments on so is there anyway to get rid of the Heavensward intro movie? This page was last edited on 7 April 2019, at 22:00.